We’d love your help. Let us know what’s wrong with this preview of A Brilliant Deception by Kim Foster. Fresh from pulling off her latest heist, Cat Montgomery believes she’s ready to leave her thieving lifestyle behind. But old habits die hard. When she’s recruited to retrieve the Lionheart, a legendary medieval ring made from the finest gold and excavated from the grave of Robin Hood, Cat’s determined to end her career with a bang. Or so she thinks…until the Caliga Rapio, a Fresh from pulling off her latest heist, Cat Montgomery believes she’s ready to leave her thieving lifestyle behind. But old habits die hard. When she’s recruited to retrieve the Lionheart, a legendary medieval ring made from the finest gold and excavated from the grave of Robin Hood, Cat’s determined to end her career with a bang. To ask other readers questions about A Brilliant Deception, please sign up. After Cat’s last heist in Paris, Cat’s in a pickle. Missing both Ethan and Jack and really beginning to question what she wants for herself in life- Cat begins to consider the idea of hanging up her jewelry heist persona. But, before she has a chance to do that- Templeton tempts Cat with one more job- a job that will be the showpiece of her career- a legendary ring that has ties back to Robin Hood. Cat decides that she will do the job- and then she will move on to “real” life- finding her place in the world. However, this job comes with loads of complications. An Interpol agent who just knows she’s up to no good, romantic complications and Brooke Sinclair. Can Cat complete the mission and be on her way to a happy life? Or does the blood a thief run too deep in her body to give up this kind of life? Cat Montgomery is my rock star. Part Alias, part Ocean’s Eleven- ALL fun- Cat uses her skills and luck to get into places and steal back priceless jewels. What I like about the series: It’s fun. It’s cute. Each story is interesting- and Cat provides entertainment! What I dislike: Nothing really! These books are fun entertainment- a professional thief with a heart of gold- caught between her feelings for 2 incredible men. Deep thinking? No- but perfect for those times when you want to sit back and be entertained. In A BRILLIANT DECEPTION- Kim Foster has a few surprises up her sleeve for the fans of Cat Montgomery and gives us a peek into some backstory of Cat’s life. I found myself gasping a couple of times because I did not see what she had in store for the readers! My takeaway: If you have read and enjoyed Kim’s previous books- then A BRILLIANT DECEPTION is just right for you. If you are considering reading her for the first time- start with A BEAUTIFUL HEIST, then move on to A MAGANIFICENT CRIME. Note: This ARC was provided by Kensington Publishing in exchange for an honest review. 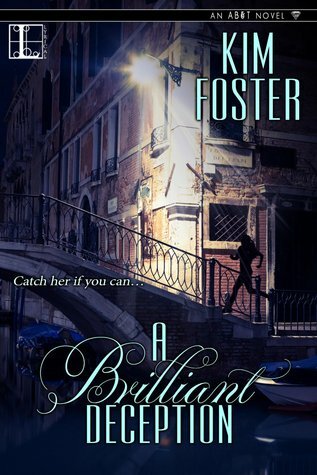 A Brilliant Deception is the third and, what I presume to be, final book in the Kim Foster-penned AB&T series about professional thief Cat Montgomery, who has been with the Agency of Burglary and Theft for a number of years and appears to be prepared to finally retire. She chooses to take on the job of going after the legendary Lionheart ring but is Check out the full review on Bookaholics Not-So-Anonymous. A Brilliant Deception is the third and, what I presume to be, final book in the Kim Foster-penned AB&T series about professional thief Cat Montgomery, who has been with the Agency of Burglary and Theft for a number of years and appears to be prepared to finally retire. She chooses to take on the job of going after the legendary Lionheart ring but is faced with numerous obstacles. There's also more than meets the eye when it comes to the ring, plus the oh-so-elusive Fabergé egg is still very much in play in this installment. As far as the rest of her life is concerned, Cat, Jack, and Ethan are all leading separate lives but fate has a way of intervening when it comes to these three and they remain intertwined, both personally and otherwise. I'm not sure what I can say about the ending since, if you've read my reviews for the first two books, you'll have an idea of what it may be based on my reaction. I suspect that it'll not everyone will be thrilled by it, but that's what tends to happen when there are two deserving guys vying for one girl's heart. Suffice it to say that my opinion of Jack was already high to begin with and it went up several notches here. Great book! I loved it all the way through! LOVED the ending! I was almost sad that it did end. Cat has done a lot of jobs, each one takes you all around the world. I do recommend reading the trilogy in order. Loved the book and loved the series; I read all three in a row after getting hooked in the first book. Pure entertainment - fast paced, fun characters and a fun story-line. One of the most unique series I've read in awhile. I think this is the last book in the series - I hope not - but many loose ends were tied at the end. A thief with a heart, a heist that is impossible, and a love triangle that leaves the reader wanting everyone to be happy. I have enjoyed this series and hope Ms. Foster continues with more books. Loved this book! It was fast paced and fun all the way through. The characters were well written and Cat was such a great character! I just love this series about ethical jewel thieves! I just hope the author writes more! Kim Foster writes YA and adult books about thieves, spies, and assassins. Her YA debut GAME OF SECRETS will be out in Fall 2017 and is a historical fantasy—a spy thriller set in an alternate Victorian world. Prior to becoming a writer, Kim went to medical school and practiced as a family doctor (don’t worry; it doesn’t make much sense to her friends and family, either). Kim lives with her husband Kim Foster writes YA and adult books about thieves, spies, and assassins. Her YA debut GAME OF SECRETS will be out in Fall 2017 and is a historical fantasy—a spy thriller set in an alternate Victorian world. Prior to becoming a writer, Kim went to medical school and practiced as a family doctor (don’t worry; it doesn’t make much sense to her friends and family, either). Kim lives with her husband and their two young sons in Victoria, BC, where she’s hard at work on her next book.